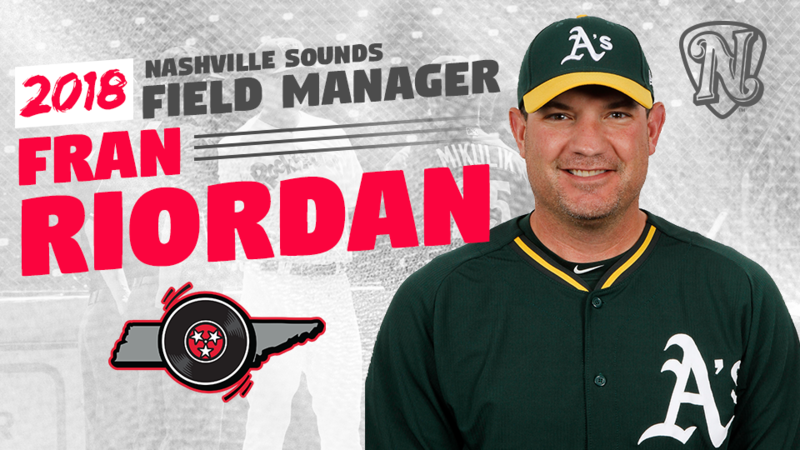 Fran Riordan has been named the new manager of the Nashville Sounds as announced by the Oakland Athletics today. Riordan is the 28th manager in franchise history. Riordan, 42, takes over the manager role vacated by Ryan Christenson who was hired as the bench coach for Oakland. Riordan will manage at the Triple-A level for the first time after leading the Double-A Midland RockHounds to a Texas League title in 2017. It was the fourth consecutive championship for Oakland's Double-A affiliate. In his 18th professional season as a manager, Riordan will be joined on the Sounds staff by four returners. Pitching coach Rick Rodriguez, hitting coach Eric Martins, athletic trainer Brad LaRosa and strength and conditioning coach Henry Torres all return to Nashville after being with the Sounds in 2017. Riordan sports a career managerial mark of 869-857 (.503) over his 17 seasons dating back to 2000. The 2018 season will be his fourth in the Athletics organization. Prior to 2017 with Midland, Riordan was the skipper for the Single-A Beloit Snappers in 2015 and 2016. Before joining the Oakland organization, Riordan spent four seasons as manager of the Florence Freedom of the Frontier League. He led the team to two playoff berths and is the all-time Frontier League leader in wins with 625. Prior to his time with Florence, Riordan managed the Northern League's Lake County Fielders (2010) and Kalamazoo Kings (2004-2009), leading the Kings to the 2005 Frontier League title. He also served as player-manager in the Frontier League from 2000-2002, leading the Richmond Roosters to back-to-back league championships in 2001 and 2002. The Virginia Beach native played seven seasons of professional baseball after playing college baseball at Allegheny College (Pa.). Riordan resides in Buffalo with his wife and three children. Rodriguez, 57, returns to Nashville for a third season as pitching coach for the Sounds. He helped lead the Sounds to the 2016 American Southern Division Championship and has helped 14 Sounds pitchers make their Major League debut over the last two years. Prior to Nashville, Rodriguez spent one season serving in the same role with Advanced-A Stockton. He was Triple-A Sacramento's pitching coach for 12 seasons, including his most recent stint in 2013-14. He also served as the A's bullpen coach from 2011-12 and as the manager of Advanced-A Modesto in 2003. This is his 34th year in the A's organization, including seven seasons as a player and 24 as a minor league coach. The East Bay, Calif. native was selected by Oakland in the second round of the 1981 MLB Draft. In 31 career MLB appearances, Rodriguez compiled a 3-4 record with a 5.73 ERA. He pitched with Oakland (1986-87), Cleveland (1988) and San Francisco (1990). Martins, 46, returns to Nashville for a third season as the Sounds' hitting coach. Martins has helped develop hitters such as Matt Olson, Matt Chapman, Chad Pinder and Franklin Barreto over the last two seasons. Martins served in the same role with Double-A Midland in 2015. Prior to his one season in Midland, Martins was a scout for the A's since 2007. During his time as a scout, Martins was responsible for signing A.J. Griffin, Daniel Robertson, and Chapman. The East Los Angeles, Calif. native was selected by Oakland in the 17th round of the 1994 MLB Draft out of Long Beach State. He played professionally for 11 seasons, including parts of four seasons with A's Triple-A affiliates. He was a part of the 1997 Edmonton team that captured the Pacific Coast League championship and the 1999 Vancouver team that won the Triple-A World Series. LaRosa returns to Nashville for his fourth season with the club and 11th as the athletic trainer for Oakland's top minor league affiliate. Prior to joining the Athletics, he spent five seasons in Double-A with St. Louis (2005-07) and Miami (2003-04). LaRosa has been recognized with several different accolades and awards, including the PBATS 2016 Pacific Coast League Athletic Trainer of the Year. In 2007, LaRosa was honored as the PBATS Minor League Trainer of the Year. He is a certified member of the National Athletics Trainer Association and the Illinois Athletics Trainer Association. LaRosa obtained both his bachelor's and master's degrees in kinesiology from Southern Illinois University at Edwardsville. Torres returns to the Nashville staff as the strength and conditioning coach. Prior to last season with the Sounds, he spent the 2016 season in the same capacity with Double-A Midland. Torres spent 2015 with Advanced-A Stockton and 2014 with Short-season Vermont. The San Antonio native began his professional baseball career in 2013 with the Kansas City Royals organization. Torres earned his bachelor's degree in kinesiology from the University of Texas-San Antonio and is a certified member of the National Strength Coaches Association (NSCA) with the title of Registered Strength and Conditioning Coach (RSCC). The 2018 season will be the Sounds' 41st in franchise history and fourth as the Oakland Athletics' top affiliate. Opening Day is set for Thursday, April 5 when the Sounds travel to New Orleans. Opening Night at First Tennessee Park is scheduled for Tuesday, April 10 when the Sounds host the Iowa Cubs at 6:35 p.m. Season ticket memberships are available now by calling (615) 690-4487 or by visiting www.nashvillesounds.com.